First of all, the JPO would like to thank the ABRSM, Rumah Terbalik - The Upside Down House in Borneo!, Tourism Malaysia Sabah, SABAH ART Gallery and a few others anonymous donors for their financial support and support in kind to make this festival possible. And we are pleased to be able to contribute and reach out to so many groups of musicians, students, communities and even the Underprivileged Kids (300+ Participants) through music making and sharing. The best part is it is all free for participants to learn with a renowned experienced international teaching faculty. The workshops are designed to cater for different levels of playing technique from elementary to advance level. And it breaks all the boundaries including country, wealth, race, religion and age group. Hence it brings about integration among the different communities. 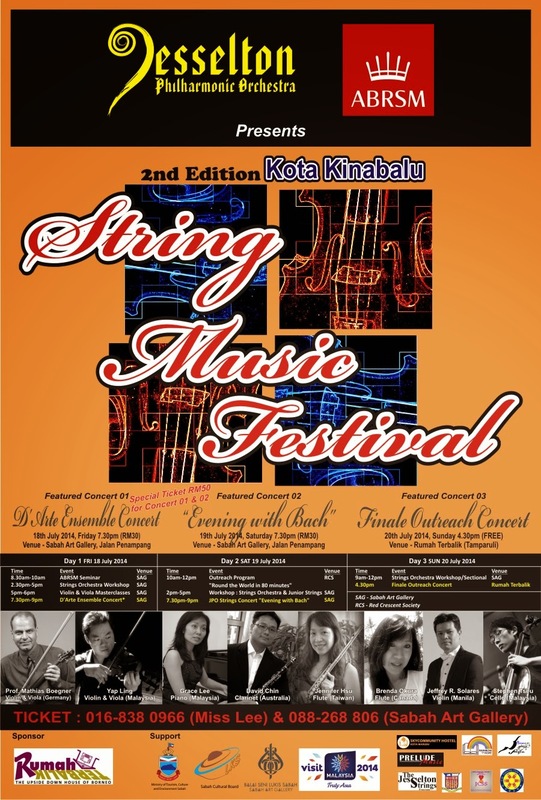 The participating groups includes members and students of Jesselton Philharmonic Orchestra, STTSS Strings Ensemble, Kian Kok String Orchestra, D'Arte Ensemble, Jireh Home, Skycommunity Kota Marudu Youth, Rainbow of Hope, Jesselton Strings Program, Prelude Music and Song En Church Strings. Our objective is to raise the standard of string playing at the same time bring to awareness the intrinsic value of string music where people can learn to appreciate the beauty it brings.